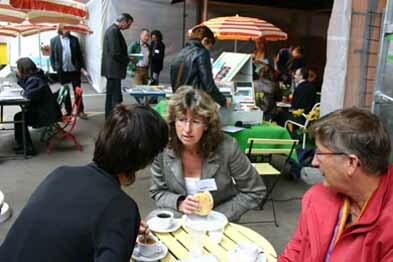 about the travel Bibliobox was invited to be part of the LOKO 06 Conference in Amersfoort on 22 June. Not exactly a village setting, but as professionals from all parts of the Netherlands were expected at this information day, it offered a good opportunity to meet people who work in a rural environment. Keynote speaker that day was Dr Claudia Buettner, one of the board members of myvillages.org. Initiator Wapke Feenstra was there to set up the box and to explain things to people visiting the stand. The Bibliobox was set out in an indoor area intended for drinks, music and chats. 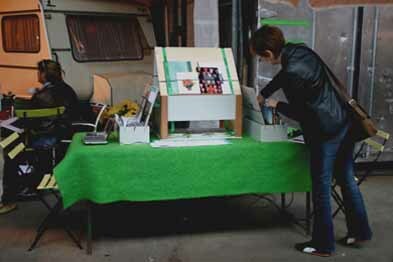 In this informal setting Bibliobox information was available for anyone with an interest in rural participatory art. in original language De Bibliobox werd uitgenodigd op de LOKO 06 Conference in Amersfoort op 22 juni. Niet echt een dorpsomgeving, maar omdat er zoveel professionals verwacht werden op deze informatiedag leek het een goede gelegenheid om mensen te ontmoeten die in een rurale omgeving werken. Een van de belangrijkste sprekers van de dag was Dr Claudia Buettner, een van de bestuursleden van myvillages.org. Wapke Feenstra, initiatiefnemer, zette de box op en informeerde bezoekers van de stand. 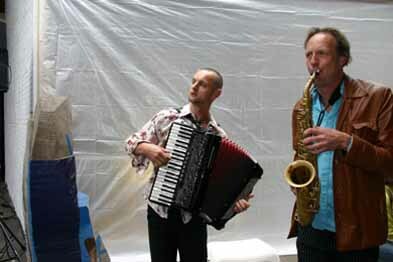 De bibliobox werd binnen uitgestald, in een ruimte met muziek, drankjes en hapjes. In deze informele setting was de Bibliobox - informatie beschikbaar voor iedereen met een interesse in rurale gemeenschapskunst. about the host LOKO 06 (an alliance of public art professionals) was organised by SKOR in collaboration with two partners. The bibliobox stand was organized by Ellen Klaus from SKOR. The conference programme focused on a number of recently launched art projects that are indicative of current public art commissions in the Netherlands. LOKO staged these presentations with the aim of providing insight into the dynamics of art commissioning, which involve participation and direct influence from the public, the integration of artwork in urban planning processes, the artist as a team participant and so on… For further details click on the link below and visit the SKOR website. in original language LOKO 06 werd door SKOR georganiseerd in samenwerking met twee partners. 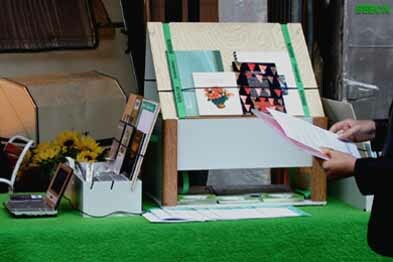 Ellen Klaus van SKOR was verantwoordelijk voor de bibliobox-stand. Het programma van de conferentie richtte zich op verschillende recent geintroduceerde kunstprojecten, representatief voor het huidige opdrachtenbeleid in Nederland. Het doel van LOKO was inzicht te geven in de dynamiek van kunstopdrachten waarbij het publiek direct betrokken is, de integratie van kunst in stedelijke planologische processen, de kunstenaar als deel van een ontwerpteam etcetera. Voor meer details klik op onderstaande link en bezoek de website van SKOR.